Virginia Is For Lovers | How Do I Baseball? Yep, the state that has a better Target than the one closer to me here in DC, which is the only reason I ever go down there Commonwealth of Virginia is known for many things, but at the top of the list should be ‘state that produces a buttload of sidearm pitchers’. Virginia is an underrated state with respect to the talent produced by the state’s high schools and colleges – hitting luminaries such as the Upton brothers, Mark Reynolds, Ryan Zimmerman, and David Wright all call the 10th state admitted to the Union (as well as the Tidewater region) home. An impressive list, indeed, especially if you like strikeouts home runs. For a more exhaustive list, you can have a look at this list of Virginians (by birth) who played in the MLB. Overall, there have been 271 Virginians who have suited up for a major league team, which is 1.5% of all players who have made an appearance in the pros, good for a tie for 18th place with Kentucky with respect to states that produce the most MLB players. However, it was an old New York Times article on Virginian sidewinders and New York Yankee bullpen buddies Clay Rapada and Cody Eppley that got me thinking about their Virginian pitching brethren, which led me to think of Javier Lopez and Cla Meredith. Hmm. All sidearmers. A curious co-inky-dink. With that in mind, let’s dig deeper, and see what kind of sidearmers Old Dominion has recently produced out of their 1.5 percent share of MLB’ers. My criterion was this – list the number of sidearmers, who were confirmed sidearm or submarine style pitchers who have made an appearance since 1980, and see who had VA ties. I only went as far back to 1980 in order to personally confirm that a guy truly was a sidearmer; plus, with the little research I did, it allowed me to concentrate on true sidearmers, versus guys who would occasionally change their arm angle here and there to get a tough hitter out, which seemed to be en vogue in the 1960’s and earlier. This criteria threw out the old timers, obviously, but also kept guys like David Cone off of the list. Again, Google was my friend with this list, so if I have missed someone, I’d love to hear about it and would be happy to edit as needed. I have also included their tie to Virginia – for those curious, Lopez was born in Puerto Rico, while Venafro was born in Maryland and Eppley is a Pennsylvanian. This gives Virginia 18% of the sidearmer share since 1980, an impressive percentage. Overall, it’s a mildly underwhelming list of names and talents; however, that is the life of a sidearmer. 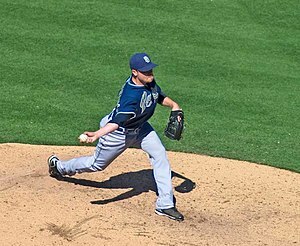 Typically converted to a sidearm delivery in the minors after not having much success getting hitters out with a more traditional over the top release point, the sidearmer very often is a hanger-on, making the most of his newly learned quirkiness to keep a job. Relegated to the bullpen and a life of one out appearances against the opponent’s best hitter, the role is one of little fanfare but much spectacle. Spectacle arising not only from an unorthodox release point, but also the lack of radar gun luminance from your fastball and the normally high pressure relief situations you find yourself thrust into. While I will leave the poetic prose and explanations as to why there exists this marriage between thankless bullpen role and the denizens, former and current, of the Commonwealth of Virginia to others, I do leave you with one request. If my Maryland in-laws ask, I never wrote this.